What happens when a veterinarian gets sick? Not 24-hour-bug sick, but full-blown sepsis, disseminated intravascular coagulation, comatose for weeks sick? Equine veterinarian Ian Nielsen had had a bad run. The veterinarian/grazier’s practice was hit hard by drought and the equine influenza (E.I.) outbreak. Then a seemingly simple stomach ache mismanaged turned into a perforated ulcer, and a sudden, critical illness. 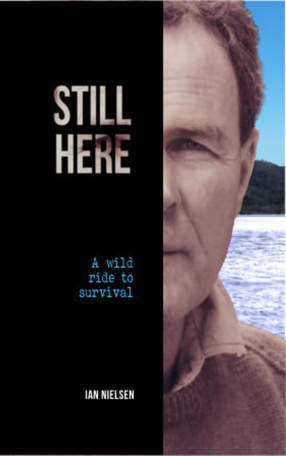 Ian survived, documenting his experience in Still Here: A Wild Ride to Survival. The book describes the ensuing farm and veterinary dramas, legal action, some very grim prognoses and a self-devised rehabilitation which even Nielsen admits was “insane”. All of this with a damaged brain, a failing heart and a “drunken” nervous system. Almost ten years later, at the age of 74, Ian continues to run an equine practice, follows a strict gym program and races a single scull in master’s rowing regattas. He is incredibly philosophical about the experience, and was happy to answer our questions. No one plans illness, but what was the impact on your practice? It was seriously badly timed. I had had insurance throughout my life – both life and income protection insurance. But it was going to end when I was sixty-four and a half (just six months before my illness). When I pulled out of my Canberra horse practice, I had let the insurance lapse. I’d been on the farm with five years of drought already and thought if I lost my health I’d battle on, but it was an earth shattering financial situation, as you go from a pretty healthy income to zero. We’d been through that before with equine influenza - going from a big income to stop. Suddenly, you don’t have a big turnover but an awful lot of expenses just to keep the practice going. With E.I., I had to decide whether to take a part-time Government job with the Department of Agriculture to help solve the problem, or should I stay on and look after my clientele? I didn’t chase the money, but decided to service my clients. We went backwards financially then. We were in the so-called green zone and all the green zone vets fell on their swords a bit. Mostly work stopped. After I was ill I couldn’t work at all. At that stage we were lucky, my wife Trish was the receptionist and book keeper and I’d wound back to a grazier-come-veterinarian. We had no wages to pay. My workload was already less than frantic, but that wasn’t entirely by choice. We’d moved to the country away from Canberra, I wanted to scale back a little bit anyway. Without giving too much away, reading your descriptions in the book, your physical condition sounds terribly painful. We all have a slim memory for pain, otherwise we wouldn’t reproduce ourselves. When I look back at the things that were painful, I now have no real concept of that pain. It seems to have vanished. In hindsight I think I was lucky to have had the experience. It was an out of body one, I was just observing what happened and because I am innately a scientist, having enough knowledge to follow my own biological mechanisms and watch healing and the body’s response to forces was just fascinating. It was a great trip. Despite surviving the ordeal you had some long-term complications including peripheral and central neuropathy, yet you continued to practice. How did you manage this? The neuropathy was crook, and in fact I am still out of balance and easily knocked off my legs. The hardest part was that I did have – and still have – some difficulty retrieving vocabulary and sentence construction. I do this constant search in my head for the right word. There has been an amazing improvement with recovery, but you can imagine it was very frustrating not to be able to say what you could think. I was not able to say it because I’d lost large areas in my prefrontal cortex and amygdala - also affecting my short-term memory. While doing my vet work I had to make very careful clinical notes. That was really good, it made me much more observant and careful about my clinical appraisal. My memory was jerked by re-reading notes, but if I ran into a client or they caught me unawares on the phone and said “Myrtle is better today”, I’d say “Give me a second, I’ll look in my book” and it turned out that I’d seen them yesterday! What about the physical side of working with horses? When I studied, equine practice was considered a men’s profession, because you had to throw horses around instead of sedating them. Even when good sedatives became available, there was a common belief that it was almost an admission of defeat and poor horsemanship that you had to resort to sedation. That belief still exists in the marketplace where people say “You don’t have to sedate my horse, the other vet didn’t”. In the old days females were considered second class citizens because they weren’t strong enough. That is nonsense. I can be blown over by a solid wind now. The truth is that horses are innately sensitive to a threat. If you are not offering a threat to them, they are calm. I wonder as I look wobbly on my feet, perhaps they see me as less of a threat. I’ve not been injured by a horse since then. As a practitioner yourself, although an expert with equine patients, how did you cope as a patient? Because I was involved with the College (the ANZCVS) and its development, and because I am intrigued by how things work, pathophysiology is what it’s all about. Epidemiology and pathophysiology are the gateway to finding out new diseases and not being surprised by things or the way they appear because it’s logical. It’s often said that in being a vet, you are your own worst doctor, but you’re probably not. Despite the fact that medicos think I am a second class medico, it has helped. I don’t just give my doctors my history or symptoms, I give them advice as well. I really feel that for my wife and I, I’ve been an asset in our medical care. She has a nasty lupus condition which manifested itself with sudden onset, strange clinical signs. I kept saying you can’t get five diseases at the same time. I said it will be one disease, because of the sudden onset. So we had 2-3 years of traipsing around to different specialists…and I was chest-thumping because of the multiple diagnoses she received. That was plain bad medicine. From the perspective of rehabilitation and recovery, an awful lot was determination (bloody mindedness) and some was knowing what I was doing. Rehabilitation is a poorly studied discipline. For example, surgeons will cut your knee open then tell you to go home – no post op advice given. Mind you we’re not much better in veterinary medicine. In horses, we have no controlled studies on recovery from bowed tendons, for example. We have studies trialling a set plan, but not against a control or against another plan. Vets write up the clinic’s advice sheet but it isn’t based on solid evidence. I did learn a lot. To have taken legal action meant my solicitors pulled out all the stops and got furious about getting proper diagnostics, so I spent many hours at hands of medical specialists one way or another. I had tests with neurophysiologists and psychiatrists and psychologists, who could clearly define the areas of brain that were destroyed, and could see it on an MRI. I’d love to have a repeat MRI now and see the extent of recovery. The plan you devised for your recovery was gruelling to say the least. To what extent do you think it is important for patients to research their condition, collect data and develop their own plans? When I turned a corner, I went from recovery to starting a program of rehabilitation with a team that I selected – a physiotherapist, a podiatrist, my consultant physician (who didn’t know he was on the team but was in charge of my heart), and my personal trainer. So three of out of four them knew they were part of the team. I also had my psychiatrist, although he also wasn’t aware he was part of the team. They were there as backstops, and I would lay down the benchmarks that I was trying to achieve…and my wife in the background was prepared to sue everybody if I dropped dead doing it while I was writing waivers saying I’d rather die than fail. I had decided on hypoxia as the cure to all nervous ills. I seemed to recover and I believe it was a genuine recovery based on my plan, not a placebo. My working title for my book was N=1, but nobody but scientists knew this is the ‘anecdotal equation’. When my consultant physician said I should write it, I said, “Come on, it’s an N=1 story. It’s not truly a scientific story”. So I don’t use references in it for that reason. But I wrote it anyway. Do you have any advice for veterinarians or future veterinarians? Enjoy it. It really is a fun job. You really do need income protection of some form or other. In my case I kept income protection insurance going all through the kid’s childhoods, and when they were at uni, so we had them covered. But after that I went along on the basis that I had cash as I needed it. As it happened we blew all that. So Trish and I are church mice now. We don’t have big expensive living habits. I row my boat, and if I can I will go back to painting watercolours. Trish sews very well. It is not terribly expensive. And I continue working as an equine vet while I can, because I enjoy it.